What was wrong this time? I had no clue. With their limited vocabulary of "hi," "nana," "dis," "d'ere," and "wow," I knew I wasn't going to get an answer. Grumbling to myself, I began to make them a cream cheese and jelly sandwich. The purple and white flag of defeat. Earlier in the day, instead of doing laundry, catching up on phone calls, or taking a rest during their nap, I cooked the trips dinner. I made something that was new to them, but included some of their proven faves: pasta, cheese, and spinach. The only new element was tomato sauce. But I already knew that the kids like ketchup, so was it really a stretch? For whatever reason, the number two has always figured in my life. You know, I was born on the 22nd. I'm the mother of twins. Goofy stuff like that. Well, as it's turned out, it's taken me just about two years to figure out what new direction my life should take. My second act, if you will. Now don't get me wrong. I haven't been just sitting around, mulling, all of this time. You know, that twins thing. Indeed, my daughters were a major reason I had stepped away from my job as a features editor at a large daily newspaper, two -- yeah, there it is again -- years ago. Since then, I've been taking all the energy and brainpower that I once deployed running a department and turning it instead into swim lessons and field trips, homework and art projects, new "mom" friends and important milestones. Still, my four year olds are now six. They're reading, dressing themselves, telling silly jokes and then cracking themselves up. At school, they were each named Citizen of the Month -- one for January and the other March. They are moving forward nicely -- so should I. The disaster in the Gulf has been riveting - in a truly horrifying way. It shows us that our reach exceeds our grasp, insofar as we undertake activities that have catastrophic (albeit--hopefully--rare) failure modes that we don't know how to cope with. The risks we are willing to take, in other words, exceed our risk mitigation and disaster management capabilities. 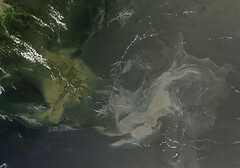 As the toxic oil and gas continues to gush into the Gulf (at the rate, some suggest, of one Exxon Valdez very 2-3 days; some suggest much less and there's controversy over the calculation, regardless), most of us can only sit and watch, stunned, as images of encroaching devastation approach vital coastlines. When I woke up on Sunday morning, my husband steered me to the front-page New York Times article, "Families' Every Fuss, Archived and Analyzed." "It's fascinating," he said. He was right. The Times piece reported on the findings of a study by researchers at U.C.L.A. 's Center on Everyday Lives of Families who spent one week videotaping "nearly every, at-home moment" in the lives of 32 families from the Los Angeles area over a three-year period. The goal of the study was to "capture capture a relatively new sociological species: the dual-earner, multiple-child, middle-class American household." In other words, my family. The 1,450 hours of video - and the article - contained a ton of data about the way we live now: "a fire shower of stress, multitasking and mutual nitpicking," according to the Times. Some of it unsurprising. Like the fact that mothers still do most of the housework, spending 27 percent of their time on it, on average, compared with 18 percent for fathers and 3 percent for children. Some of it unpredictable. For example, the fact that mothers were more likely to be watching TV when alone with a child than fathers, who were more likely to be engaged in some activity. Huh? Some of it eye-opening. Like the correlation between clutter on the fridge door and the amount of clutter elsewhere in the house. (If you can't get enough, you can read more about the study in UCLA Today.) And all of it disturbing. Still, I thought I could imagine some revealing family moments based on some of the observations in the article. So, I did, keeping in mind the team of researchers filming in the background. Any resemblance to real individuals, dead or alive, including my own family, of course, is unintentional. This is entirely a work of fiction . . . .